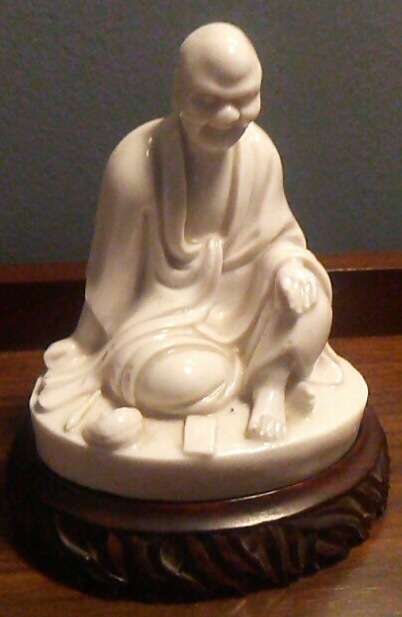 I'm on a road trip doing some shopping and I bought a very nice small Dehua figure of a Louhan with a mark on the back. However, I can't figure out the mark. It kind of looks like a Qianlong mark, but I'm just not sure about all the characters nor the order. Could someone help with a translation? Tim, when I squint tightly, this mark seemingly reads down and across from the top right in zhuanshu script as "He Chaochun Yin" (何朝春印), "Seal of He Chaochun). He Chaochun and his brother He Chaozong (何朝宗) were well-known Dehua potters of the Ming dynasty, who often were copied in later times, including the contemporary period. I've included herein a link to a Bonhams auction with images of a mark & period Guanyin sculpture by He Chaochun. You'll also find other forum discussion by searching his name. 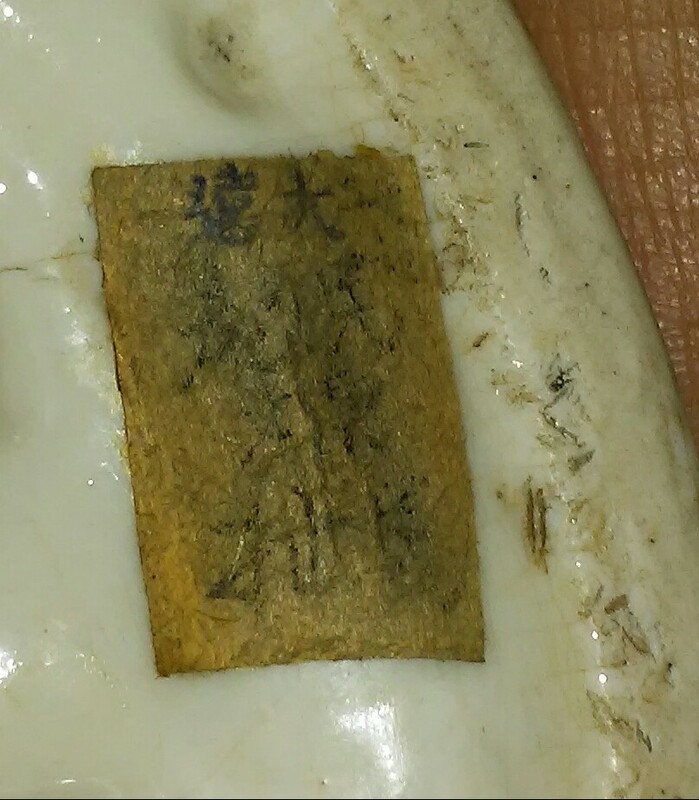 I thought his marks were always gourd shaped, but thanks to your help I found the very mark on a Chinese website. 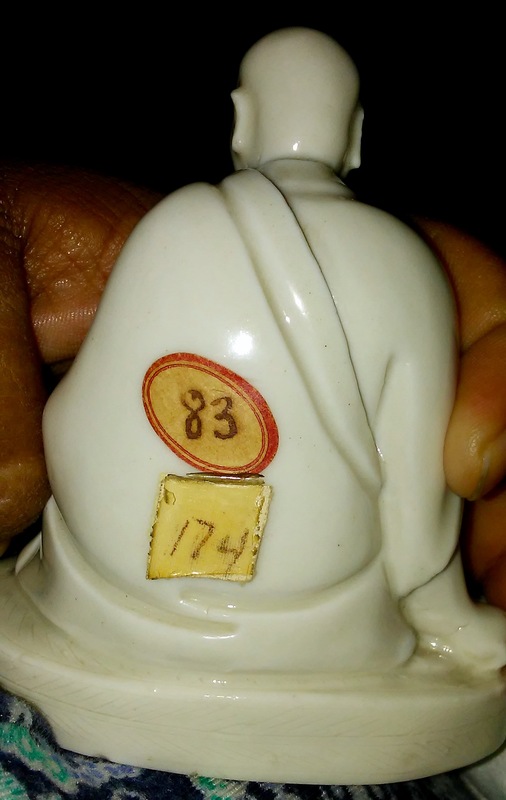 Perhaps since this is such a small figure (3.75" tall w/o stand) that there was only room for the square mark. A lucky find while picking along the way to NY - whomever first put the piece into a collection put a catalog label over the mark, so I didn't see the mark until I took the label off after I bought it. However, the nicely carved zitan stand was enough for me to decide to pull the trigger and buy the piece. No pressure, but would you take a shot at reading the cloth label on the inside? My photo capability of my cheap phone is not great, not to mention how worn out the label is. I found this one Christie's sale of a He Chaochun Guanyin 6.5" tall that brought a staggering 385,500 euros, but the estimate was 20,000 a 30,000 euros. I tried to squint something out of the fragmentary characters on that cloth label, but nothing useful came of it. The first character at top right is "da" (大 - big/great) or maybe "tai" (太 - highest/greatest). The one beneath it looks a bit like "xian" (先 - first). Nothing really readable ensues until the top again, where the dark blob resembles "zao" (造 - made) or maybe "yuan" (遠 - distant/remote). I used Photoshop to little avail trying to enhance the photo, but the foregoing is all that even warranted speculation. Occasionally ultraviolet light will bring out some types of ink residues, but Photoshop has its limits.